iPhone secrets — we can’t get enough! Here’s the latest Apple v Samsung legal news of Judge Julie Koh’s District Court of Northern California. 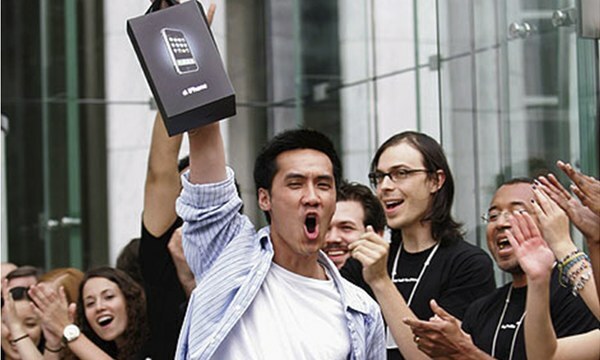 For example, iPhone, iPad and, wow, iPod touch sales are more impressive than many have imagined. However, for its part, Samsung’s sales are frankly rather disappointing, especially Galaxy Tab unit volume, which have been even more pathetic than the haters imagined. And, let’s get the bad news out of the way first. Since 2010, Samsung has sold a total of 1.4 million Galaxy Tabs, which less than the company originally claimed for the holiday quarter of 2010 alone. Remember that fiasco? Samsung said, to a chorus of disbelieving jeers, that it sold 2 million Galaxy Tabs (Figure 1) in the final three months of 2010. Now, it has been revealed that consumers only purchased a bit more than 200,000 units — shnork! Further, Samsung documents entered into evidence show that the company sold 21.25 million handsets (Figure 2), delivering $7.5 billion in revenue from the devices covered in Apple v Samsung. 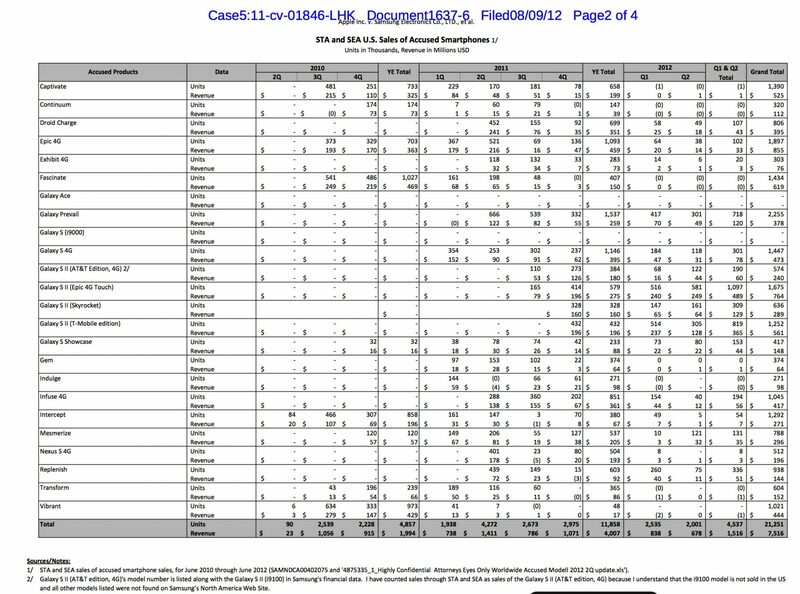 However, the biggest share of units moved were cheapo smartphones, i.e. Galaxy Prevail (i.e. runs Android 2.3), sold via Sprint and its Boost MVNO affiliate. All of those Verizon and AT&T commercials pushing high-end Samsung smartphones? They haven’t delivered sales, which makes you wonder why the carriers have invested so much — certainly bitterness toward Apple and high iPhone subsidies have played a role. 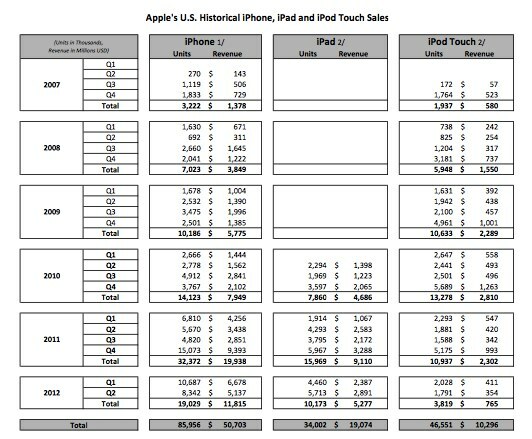 Apple’s sales totals for the US are a different story entirely (Figure 3) — iPhone, 85 million; iPad, 34 million; and, somewhat surprisingly, iPod touch with 46 million units. All told sales of these three devices delivered nearly $80 billion in revenues. Further, Apple is said to have earned $590 for each iPhone, which speaks well of their product mix — higher end models sold well. And, the company pulled in $560 per iPad sold, indicating that the company’s tablet sales have skewed strongly toward the low-end, wifi-only model that sells for $499. That said, one assumes that as more quarters of $399 iPad 2 sales get tallied that Apple’s average selling price for tablets will come down even further. There is little doubt (here and here) that Samsung did indeed copy the iPhone’s design, user interface and applications. However, it’s also increasingly clear what an incompetent, bungled job Samsung has made of the effort. Yes, Samsung “borrowed liberally” from Apple’s iPhone patents, but they have failed miserably, at least in the US, to actually profit from their larceny. And, the proof lies in the numbers, where the best-selling smartphone is a fugly little thing running Android 2.3 — “2010 called and they want their…” — and we also see clearly that the Galaxy Tab was a non-factor in the tablet market. Why on earth do Best Buy et al give the Galaxy Tab so much space given the pathetic results? The mind reels.